HABIT: Tender evergreen shrub used as an annual for foliage color. 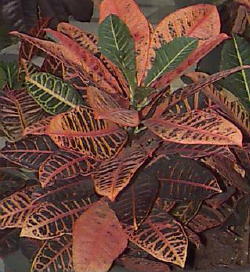 Large colorful leaves with yellow and red variegations. CULTURE: Plant in well prepared beds. Color is better in full sun than in shade. USES: Summer color, potted plants to be moved indoors in winter. PROBLEMS: Red spider mites on stressed plants, root rot in poorly drained soils.